The third year of the free Color Giants Expo moves (temporarily) away from animation to feature two events featuring iconic underground cartoonists. 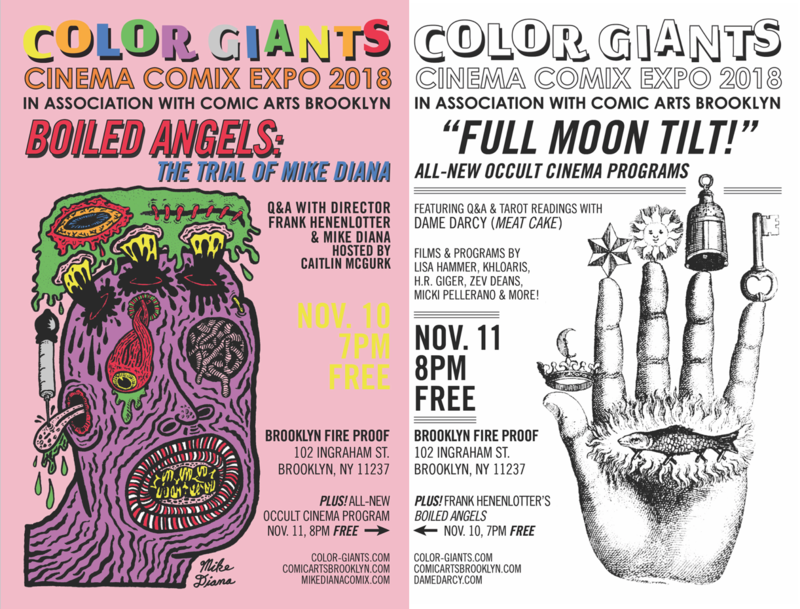 Nov. 10th at 7pm is the second-ever NYC screening of the 2018 feature documentary Boiled Angels: The Trial of Mike Diana directed by Frank Henenlotter (Basket Case). The titular Mike Diana (“Boiled Angel”)—the only artist in US history convicted of obscenity, whose legal battle is the subject matter of this important film—will be present for a Q&A with director Henenlotter. The Q&A will be hosted by Caitlin McGurk and Robyn Chapman. Nov. 11th at 8pm are new programs of occult-related films, with a live Q&A and tarot readings with cartoonist and witchcraft-enthusiast Dame Darcy (“Meat Cake”). Films will include works by Dame Darcy and Lisa Hammer, Zev Deans, H.R. Giger and more. Programmed by KHLOARIS as part of the Brooklyn Fire Proof Screening Series in association with Comic Arts Brooklyn. Both programs are free. This program is for adults only, and no children will be admitted. For questions or comments, please email us.